This religious ceremony of the Blessing of the Hounds, on or near St. Hubert’s Day, which is traditionally November 3, is a custom that has survived since early medieval times. It had its origin in the belief that by this blessing, through the intercession of St. Hubert, the hounds would be protected from disease. St. Hubert, the patron saint of the hunt or the chase, was born in the middle of the 7th century. His early life was given over entirely to pleasures and worldly vanities, and his chief passion was to hunt. At the age of 27 or 28, on one Good Friday morning, when all the faithful had repaired to the Church, Hubert, in open defiance of pious custom, sallied forth to the chase. As he was pursuing a stag, the story goes, the animal turned, and between its antlers was a crucifix. Hubert renounced all his honors and rank, distributed his personal wealth to the poor, and entered the priesthood. He later became the Bishop of Liège and since his canonization, has been the patron saint of archers, forest workers, hunting, hunters, and hounds. 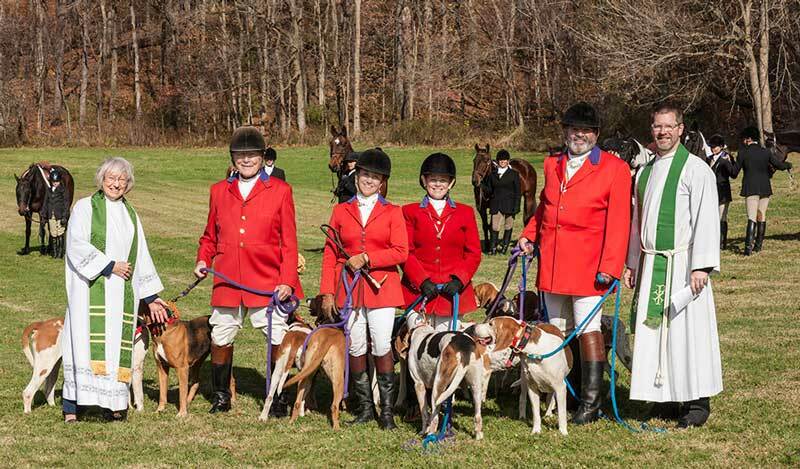 During the ceremony, hunters, hounds, and horses are blessed, with prayer for safety and good fortune during the hunt. 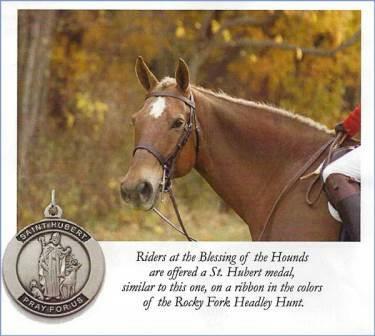 Medals bearing the image of St. Hubert are given to riders, to remind them of this hunter of old, and ask for his protection during the pursuit of fox or other quarry. We seek to find meaning in the simple and wholesome pleasure of our relationship to the natural world, and our enjoyment of the company of one another.